Abstract—Previously listed possible synergies between energy poverty and climate actions have been mostly addressing either climate change mitigation benefits of reducing ambient air pollutants or benefits of increased deep energy-efficiency and energy conservation through better technologies. This paper, however, analyses implications of access to modern energy on environmental and human wellbeing from the perspective of adaptation to climate change and argues for another additional synergy between two seemingly separate issues; the impacts of improved access to modern energy services on the households’ resilience to climate stress. This argument is illustrated through describing energy poverty situation and climate vulnerability of Mongolia, a lower middle income country in Northern-east Asia. Which is then followed by identification of possible direct benefits of modern energy services on improved human, financial and natural capital - crucial determinants of adaptive capacity of households to climatic disruptions. Index Terms—Energy poverty, climate change adaptation, climate resilience, Mongolia. Bilegsaikhan Sumiya is with the Graduate School of Environmental Studies at Seoul National University, Seoul, 151-742, Republic of Korea (e-mail: sumi@snu.ac.kr). 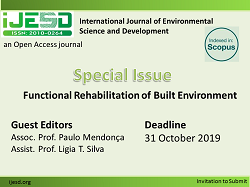 Cite: Bilegsaikhan Sumiya, "Energy Poverty in Context of Climate Change: What Are the Possible Impacts of Improved Modern Energy Access on Adaptation Capacity of Communities?," International Journal of Environmental Science and Development vol. 7, no. 1, pp. 73-79, 2016.